A deep breath, a quick jump over the lip and you're carving the perfect line through untracked powder–living the dream in the Mens Exolight Icy Jacket from Jack Wolfskin. Powder or piste, this jacket is serious about snow. Wear it and you'll hardly notice the freezing cold temperatures on the summit or the wind on the ridge. That's because it features an innovative synthetic fibre insulation. 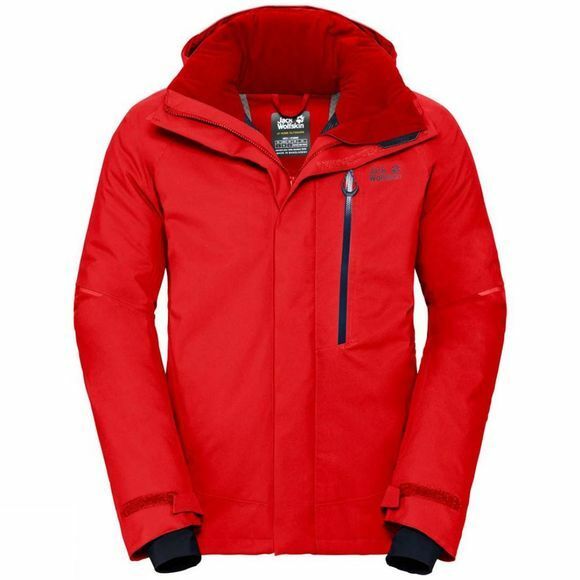 It insulates extremely well, and it's exceptionally light and highly breathable–the perfect mix for action-packed days in the snow. And it gives you best-in-class protection from the elements. It was developed specifically for dynamic winter activities. It is totally waterproof and windproof, with multi-directional stretch properties and a pleasantly soft feel. It provides good heat retention and superior air permeability on the back to keep you comfortable. So the jacket gives you the right levels of insulation and breathability exactly where you need them. Pit zips provide a quick blast of fresh air on the move–handy when you work up a sweat. And of course also included a ski pass pocket, a snow skirt and a RECCO chip, plus special docking loops that allow you to connect the jacket to the matching ski pants.